Lumpbreaking Conveyors or Shakeout Sand Conveyors are used when shakeout sand lumps are to be reduced in size while they are being transported a needed distance. A series of inclined ramps collect and trap the sand lumps. 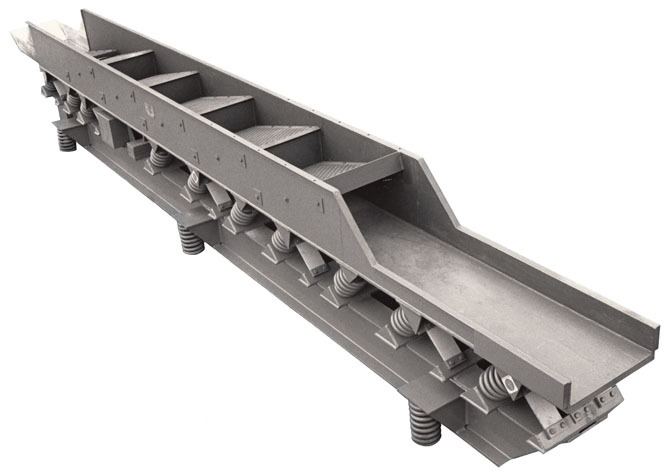 They break down in size until they can pass through the openings in the ramps and onto the conveying trough below. A 75% decrease in power consumption for these needed units. The electrical control for output adjustment is greatly simplified. The few interchangeable drive components are a relief to maintenance. The cost is competitive with units equipped with alternate drives. To learn more about all of Kinergy’s innovative Foundry Machines, please contact Kinergy at 502.366.5685 or download Kinergy’s descriptive Bulletin KFE entitled “Foundry Units” and Kinergy Bulletin entitled "One Simple Common Drive for Foundry Vibrating Equipment". 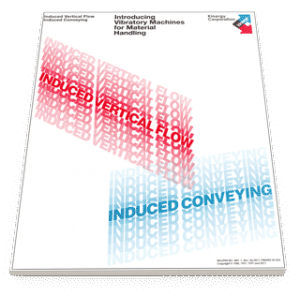 Free Booklet: "Introducing Vibratory Machines for Material Handling"
Realizing vibrations can be very destructive, Engineers seldom considered intentionally creating vibrations in a machine to perform a beneficial function. Even so, over the years and by taking advantage of the principle of “Natural Frequency”, these purposely vibrated machines have been gradually but steadily improved. Thus, these Electro-Mechanical Machines now have more Electrical Operating Versatility and are ranked among the most “Energy Efficient” available. This history and the progressive evolution are explained in the Booklet entitled “Introducing Vibratory Machines for Material Handling”. The booklet is intended to be educational and is available upon request.